Nothing says “Mardi Gras” like a Hurricane, and this Hurricane Snow Cone gives you all those fruity, wonderful flavors – on ice! “And why would I want my Hurricane in the form of a snow cone?”, you ask. Here’s why! A traditional Hurricane is made with Orange Juice, which is really delicious but also pretty high in sugar and calories. In contrast, this Hurricane Snow Cone is made with Sparkling Ice (Orange Mango flavored – YUM!) AND served over shaved ice. So if you are watching your weight, you’ll be happy to know that these Hurricane Snow Cones work out to only about 186 per drink – served in one of those big Hurricane glasses, of course! But wait – there’s more! The kids will love these, too, and it’s so easy to make them kid-friendly. Just leave the rum out. Simple as that. So your whole family can happily enjoy these delicious fruity drinks for Mardi Gras – or on a hot summer day. These Hurricane Snow Cones are so delicious, you’re sure to want them more than once a year! Enjoy a delicious #Hurricane Snow Cone for #MardiGras! 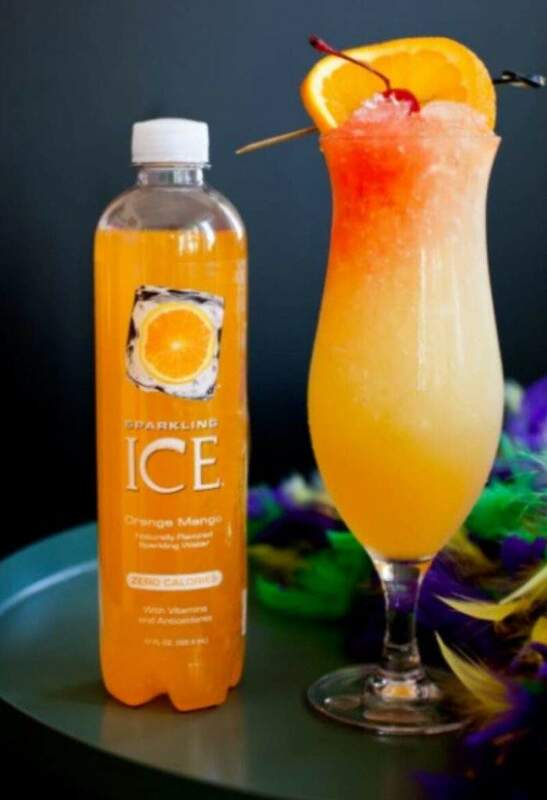 Because we’re making this drink with Sparkling Ice rather than orange juice, you’re able to reduce a bit of your Fat Tuesday calorie intake. A traditional hurricane has a lot of orange juice in the recipe, but ours only has 186 calories per drink. 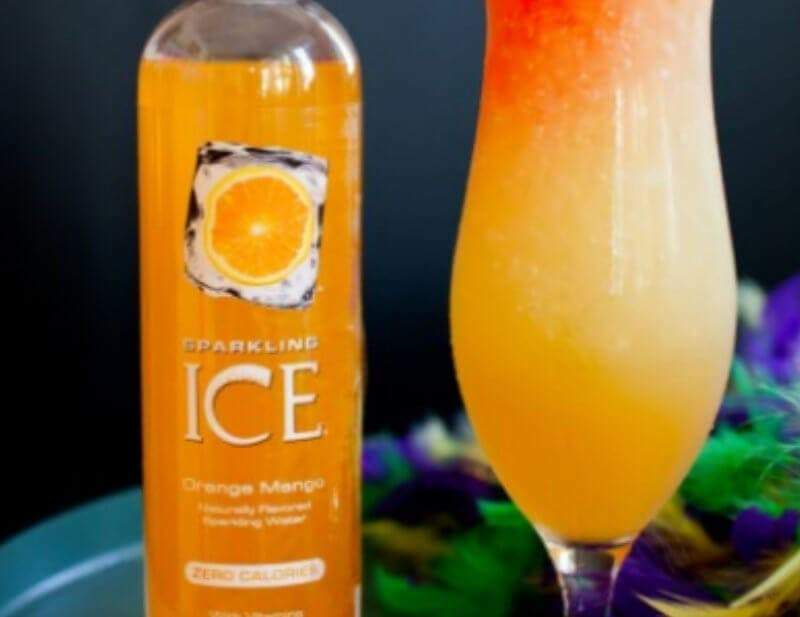 Thank you to our friends at Sparkling Ice for sharing their recipe and photo with us. Serve in a hurricane glass to enjoy for Mardi Gras. 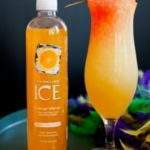 To enjoy a virgin hurricane snow cone, simply omit the light and dark rums and add more Sparkling Ice. Squeeze juice from half a lime into cocktail shaker over crushed ice. Pour the rum and passion fruit juice into the shaker and shake gently before pouring into your glass. Top with Sparkling Ice Orange Mango. Pour grenadine over the top so that it makes a reddish layer on top. Strain into a hurricane glass filled with shaved ice, garnish with a cherry and orange slice. Note: We’ve served our frozen hurricane in a proper hurricane glass so you can see how it looks. But of course, you can serve it like an actual snow cone. To serve in a paper cone, first add your crushed ice, then mix the drink in the shaker and pour over the ice. Top with the grenadine for the final step. A Hurricane Snow Cone is the perfect, lightened-up drink for Mardi Gras. Served over crushed ice, it's a delicious way to enjoy a twist on the classic hurricane. Pour the rum and passion fruit juice into the shaker and shake gently. Note - Serve in a Hurricane glass to enjoy for Mardi Gras. Please let us know how you enjoy our Hurricane Snow Cone recipe. If you make it yourself, please let us know on Pinterest that you tried it and tag us with #champagneandcoconuts on your Instagram photo. If you haven’t had a chance to make it yet, be sure to save the recipe on Pinterest so you’ll remember where you found it.